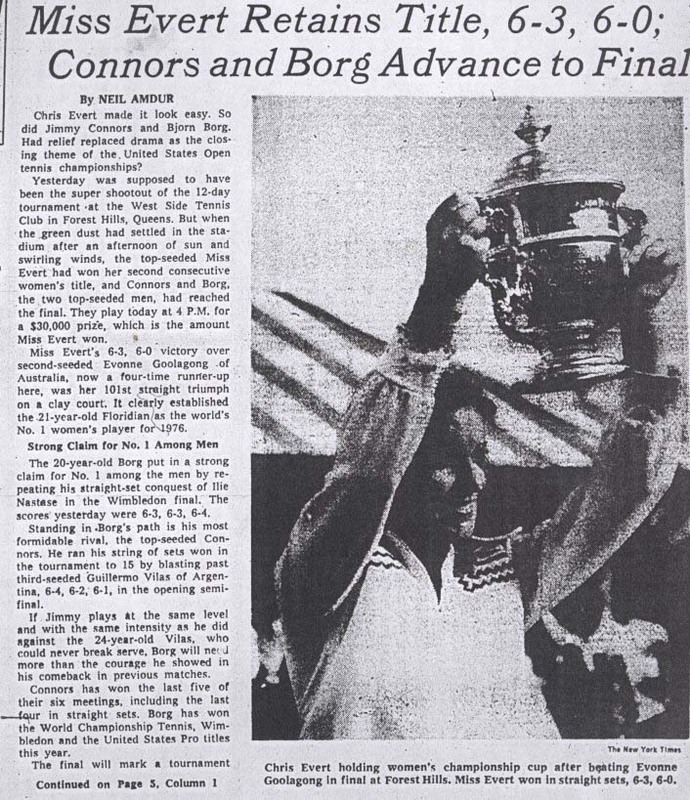 Here is a trivia question for the mid 1980's: Evonne goolagong has beaten Chris Evert in the finals of WImbledon and Forest Hills five times, right? And Chris has also beaten Evonne five times in the finals. Now the question is, when and where did these two champions first meet? Don't know? It was back in march of 1972, march 8, a Wednesday to be exact, at a place called the T Bar M Racquet Club in Dallas. No, no, they didn't play each other, Billie Jean King prevented that by beating Chris in the quarterfinals. But Chris and Evonne were introduced during the tournament. They had lunch and shared a few giggles, all the time sizing each toher up like a pair of strange heveyweights. They knew they would be seeing alot of one another during the next 10 years or so. Final question: Remember who won that tournament? No, not Eveonne. In the semifinals she, too, was beaten by Billie Jean who, though tired, was playing as though her life depended on it. 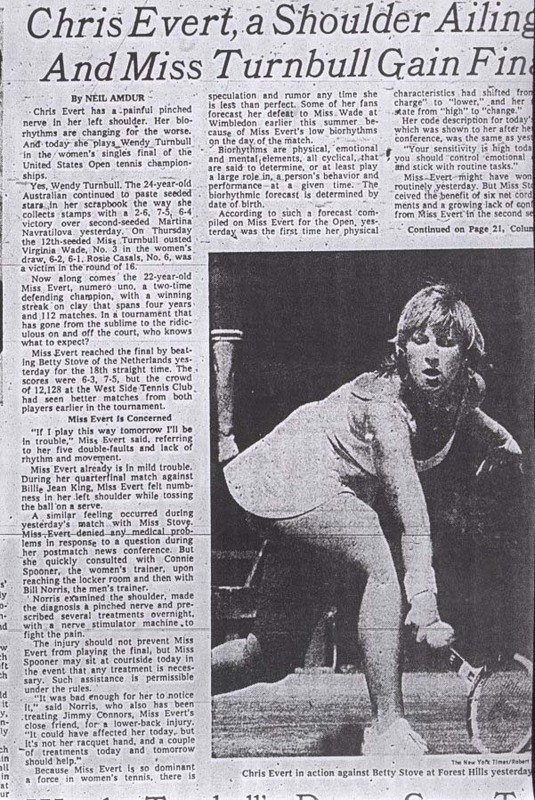 But billie Jean did not win, either, because waiting for her in the final was Nancy Richey Gunter, cool and rested, and she gunned down Billie Jean 7-6, 6-1. 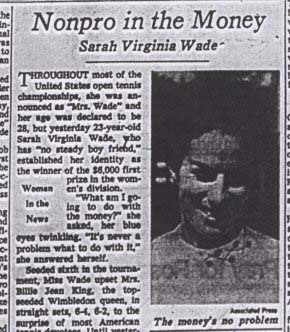 That earned her $11,000, which may not seem like much now, but at the time was the highest purse in women's tennis. 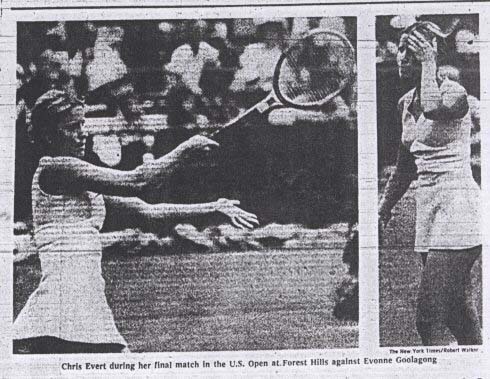 For a while last week it seemed as if Chris and Evonne would not meet even socially, Evonne was the first to arrive, flying in from Sydney with Edwards four days before the tournament began, her first trip to the US. She submitted to a mass interview, complete with klieg lights and microphones around the neck. Asked if she had ever eaten mexican food, she said no. The next day six Mexican restaurants called offering free meals. One afternoon she went to Neiman Marcus where she thought about buying two Stetsons for her brothers and decided against it, but mostly she spent her time practicing at the club with one of the local pros-Edwards always has Evonne work out with men on the theory that there is less horsing around-and staying indside her motel room watching television. When the grand meeting did occur, it was as formal and solemn as that recent one in China. The two girls shook hands. Edwards and Evert shook hands. Edwards shook hands with Chris . Evert shook hands with Evonne. All of them, plus a few others, were seated at a large round table in the middle of the dining room. Evonne ordered salad. Chris declined to eat because she had a match soon. Evonne admired Chris' tennis sweater. The two girls talkd music. Evonne was sorry she had left her casette player in Australia. Chris wondered if that girl over there by the window was her first-round opponent. Evonne said it was. Neither asked how the other was hitting them. Mrs. Court who at 5 feet 9 inches is two inches taler than Rosewall, overshadowed the women's field. 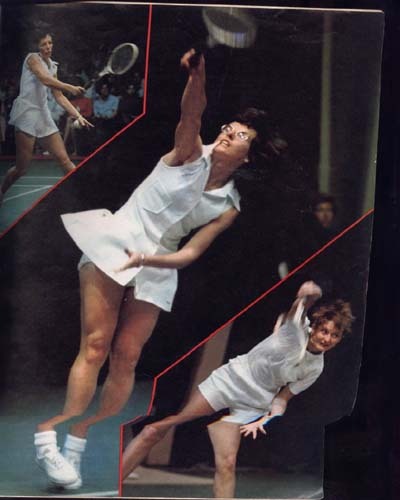 She achieved the last leg of her singles grand slam with a 6-2, 2-6, 6-1 triumph over Rosemary Casals, a victory worth $7,500; teamed with Marty Riessen for the mixed double crown, 6-4, 6-4 over Mrs. Judy Dalton and Frew McMillan worth $1,000 more from Saturday's women's doubles championship. In a move that may helf to make her the first woman athlete to earn $100,000 in a single year, Mrs. Court received another 500 shares of stock from her racquet manufacturer, the Chemold Corporation of Jamaica, Queens. 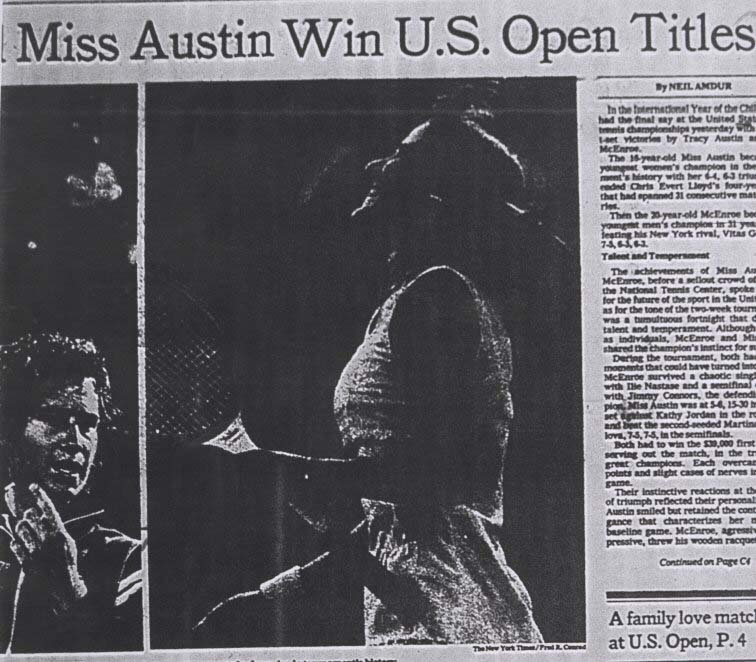 In addition to the victory, coupled with her titles in the Australian, French and Wimbledon championships Mrs. Court has a t least 2,000 shares of stock, currently valued at about $1.50 a share, a new contract for 1971 and courless opportunities for commercial endorsements. Mrs. Margaret Court is known around the world for her serve, volley and overhead , but her husband, Barry, will tell you that no one cooks roast lamb or barbequed ribs better than his wife. "She picks up recipes all over the world," Barry said yesterday. "And she'll ask the butcher back in Perth for cuts of meat he's never heard of." Unfortunately, the Courts are not home long enough for Margaret to experiment with new gourmet dishes, photography, another hobby, or fashion design, in which she dabbled several years ago as a part owner of a boutique. "We don't even have much time for sightseeing," says her 28-year-old husband, a hawk-nosed 6-foot-2 inch wool broker and yachtsman. He met Margaret during her brief retirement from tennis in 1966 and married her one year later. "The trouble is she gets to the final of every tournament and that means she's playing form Sunday to Sunday. "My femininity is something I have always tried to preserve in this dog-eat-dog exitence." she said yesterday. " I'm sure if I could not, then I would prefer to bow out of othe game. I try to hit a tennis ball as hard as I can; if I have trained myself to a masculine degree of efficiency in this respect, it does not mean that I have forsaken any of my femininity." She was born on July 1, 1942 in Albury, Australia, a small border town on the Sydney-Melbourne railway line. Her father was a foreman in a cheese-and-butter factory. Neither of her parents played tennis. 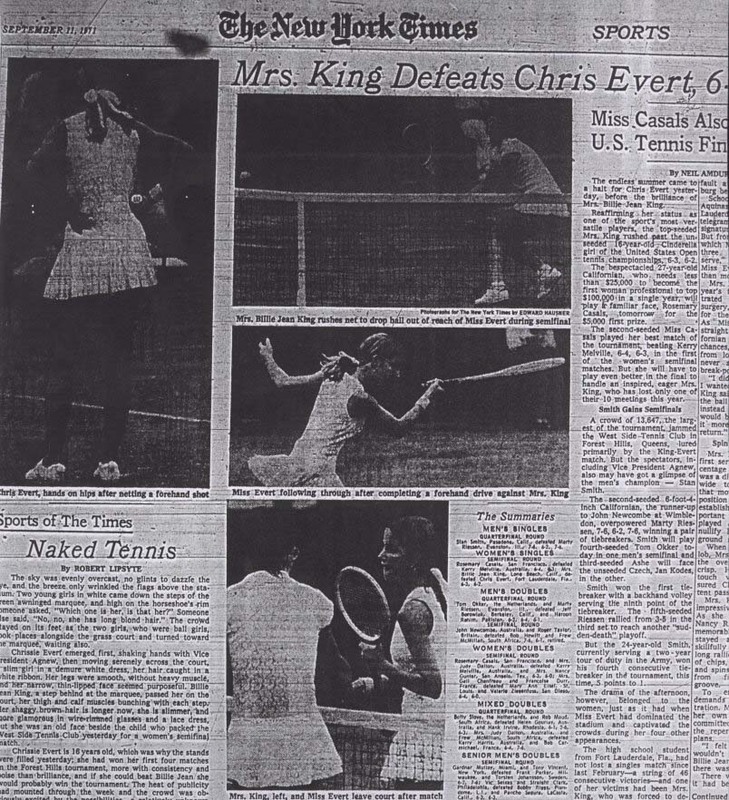 Chris:"I never thought I'd win"
"This has to be the year's biggest upset," a champion of underdogs said gleefully yesterday after Evonne Goolagong beat Chris Evert in the opening set of their United States Open tennis final yesterday. "It hasn't transpired yet," the man's companion shot back. It never did . But even Miss Evert, nailing down the title that had escaped her for so long, was surprised the upset had not taken place. "All through the match I never thought I'd win," the 20-year-old Florida slugger said afterward. "I was pretty down the whole way." 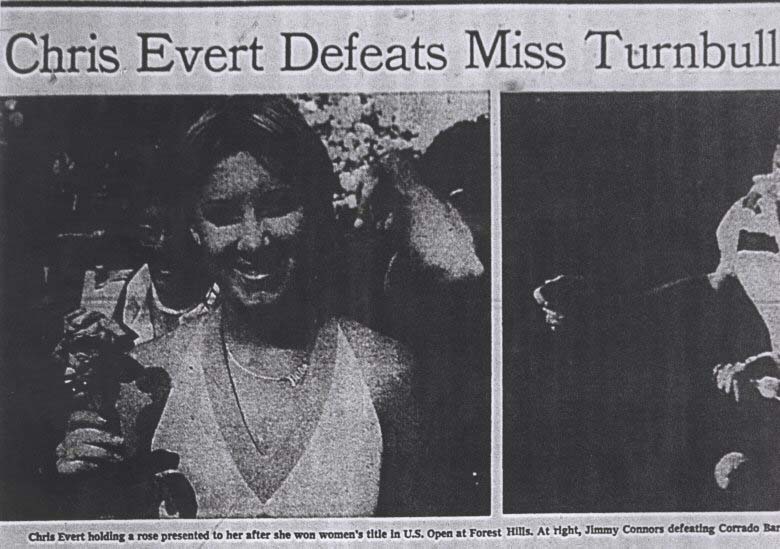 When it was over, with Miss Evert having worn down her 24-year-old Australian opponent, 5-7, 6-4, 6-2, everything seemed almost routine. The queen of women's tennis had won her 84th straight match on clay over 2 1/2 years. 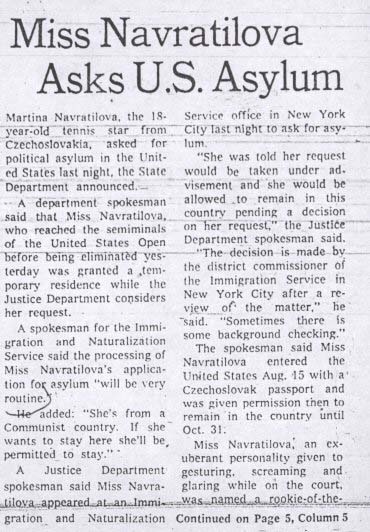 She had increased her 1975 earnings to $280,027 and the victory had prompted some of those in the crowd of 15, 720 at the West Side Tennis club in Forest Hils, Queens, to say jokingly: "What a surprise! Chris Evert won." 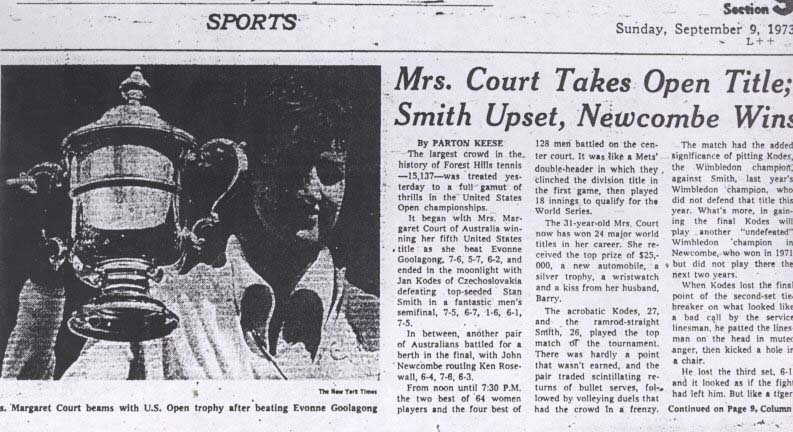 Yet this was a match that could be understood by atheletes who know about momentum and competitive fires Miss Goolagong, playing what some of the experts considered the finest match of her career, had Miss Evert hanging on the ropes like a wobbly fighter whose punchies had lost their sting. The favorite's devastating, two-fisted backhand wasn't doing much damage her occasional trips to the net weren't producing winners-and Miss Goolagong was getting everthing back. When the Australian took a 2-1 lead in the third set on a service break, the upset script appeared eady to run its course. 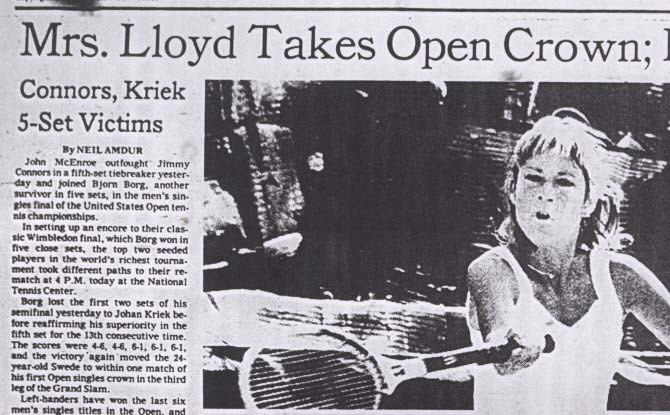 That's when Miss Evert got more aggressive, when Miss Goolagong's concentration began slipping and when the crowd began cheering for the top-seeded Floridian as a kind of one-time underdog. She wrapped it up by winning five straight games. "I was thinking in myself that maybe she'll have one of her walkabouts, or whatever, where she loses concentration,"Chris said. "so I stayed in there." 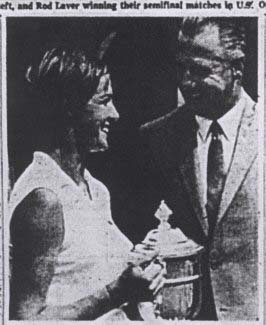 Miss Evert had been trying to win the Open since 1971, when at 16 she became the youngest playerto reach the semifinals. She had never got past the semifinals.